Explore White Mountain & Top of the Rockies' 2,500 acre PRIVATE preserve high on the Continental Divide. Experience over 8,000 feet of zip lines on 6 different zip sections, 4 with twin lines. Travel to the zip course up steep scenic trails in a 6-ton Monster Truck. See historic mining claims and possibly some of the abundant wildlife on your way to 11,500 feet above sea level for the first departure deck. It's the only zip line to fly above a train! For the Grand Finale, fly the BIG NUGGET to the end of the line. IT'S A TRIPLE ZIP landing on a 100' tall scenic tower. Return to earth on wide stairways and relax on six viewing decks on the way down. Be surrounded by some of the tallest mountains in North America with Mount Massive and Mount Elbert, 2 of the fabulous Fourteeners, to the South and Mount Arkansas to the North East. 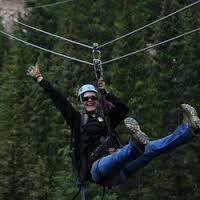 Zip line tour guides are trained on the site and accompany guests through the entire course. All decks are flat on the side of the Mountain for easy access. All zips have double overhead cables for safety. "Self Braking" is not required. Top of the Rockies is about 45 minutes from Breckenridge, Keystone, Vail & Beaver Creek. It's approximately 2 hours from Denver and 15 miles south of I-70 on Hwy 91, Exit 195 Copper Mountain. Iti's always cool in the high alpine altitude, even in the middle of summer.